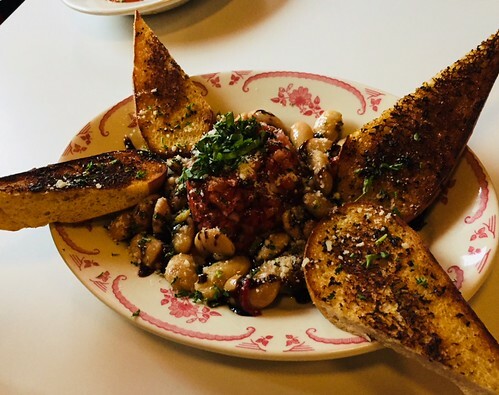 Classic Italian Eating at Geno’s Northeast - Minneapolis Riverfront News - Minneapolis Riverfront Neighborhoods. Look up for Geno’s signWalking or driving past, you could miss Geno’s in the blink of an eye. This new restaurant is located a few steps past the Lund’s parking lot entrance on 4th Street SE between NE Central and Hennepin Avenues, but if you get to Hennepin you have gone too far. 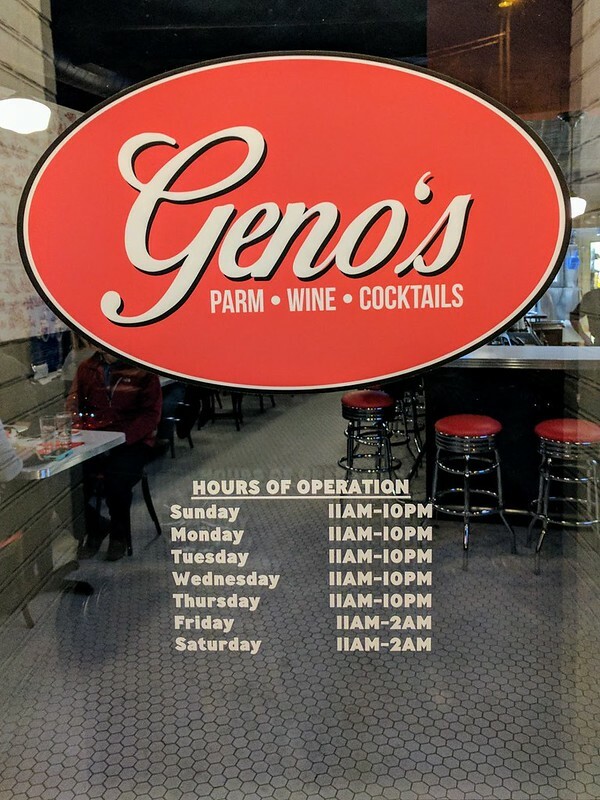 Look for a biggish red sign high above the entrance and you will see Geno’s below. It is worth finding for many reasons. First, really delicious and classic Italian food at more than moderate pricing. Also, there is a warm ambience about the place as it is decked out in black and white with splashes of red. 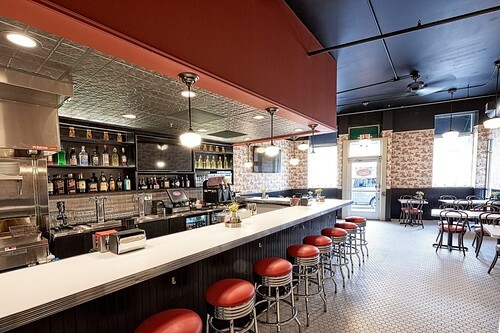 The long bar with comfy bar stools is fully stocked and also serves specialty drinks plus red and white wines on tap! General Manager Nick Kelly tells me that everything in the place is thoroughly thought through and intentional. 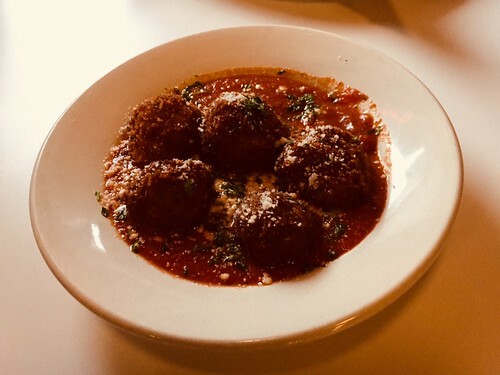 Owned by the Taphouse Group, which also owns restaurants in Uptown and south Minneapolis, this is their first venture into Italian. And it works very well. Here is the drill, Geno’s-style: First, you choose your “vessel” or plate – could also be an Artisan sourdough sandwich or a Kaiser roll. Step 2, you pick your main course or the “goods”. Everything from chicken to eggplant, pork chops or meatballs. Then you get two sides making for a very full platter. Sides include everything from potatoes or spaghetti to salad or soup. You could add appetizers, or just go for spaghetti and meatballs or lasagna. Desserts too. All of this for as little as $15.00 depending on your choices. A slushy cocktailThey use limoncello too, one of my favorite liqueurs. You’ll find a limoncello “slushy” or it’s in the Cannoli dessert with mascarpone. I had a limoncello sour cocktail which was wonderful. Because they are on tap, wines are kept at the perfect 45 degrees for whites and 62 degrees for reds; they serve wines from Italy, Argentina and California. 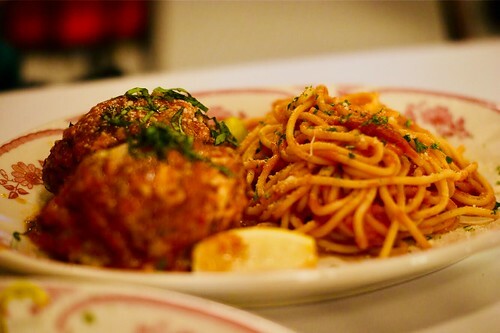 The food is great – the Italian fries are tossed with truffle oil and parsley; the soups are a tasty red pepper, a mushroom bisque and pesto chicken noodle; nice salads and both the spaghetti and lasagna are delicious. What is the secret of their tomato sauce? I could not find out. And then there are the meatballs! Really, I mean really delicious. Definitely give it a try. Geno’s is located at 12 4th Street SE; 612-236-4335, and on the web at www.genosmpls.com. Their hours are amazing: open all day from 11AM – 10PM Sunday through Thursday. But open and cooking 11AM until 2AM Friday and Saturday nights. This is the perfect spot when you are hungry late night.